Doors open at 6:00 p.m. | Concert begins at 7:00 p.m.
Women's Ministry is excited to host a community-wide concert as a part of the Night of Hope Tour, featuring music artist Christy Nockels, to begin the Christmas season! All are invited to this special evening of celebration and praise as we prepare our hearts for the true meaning of Christmas: the birth of Jesus Christ, the Son of God and Savior to a weary world. Everyone is welcome! Invite your friends, relatives, neighbors, and co-workers to this one-night-only event held in The Church of The Apostles' Sanctuary. Tickets: $20 per person | Children 12 and under are free! TICKET SALES ARE OPEN NOW! Use the code “DEC07” to receive $5 off the general admission price! 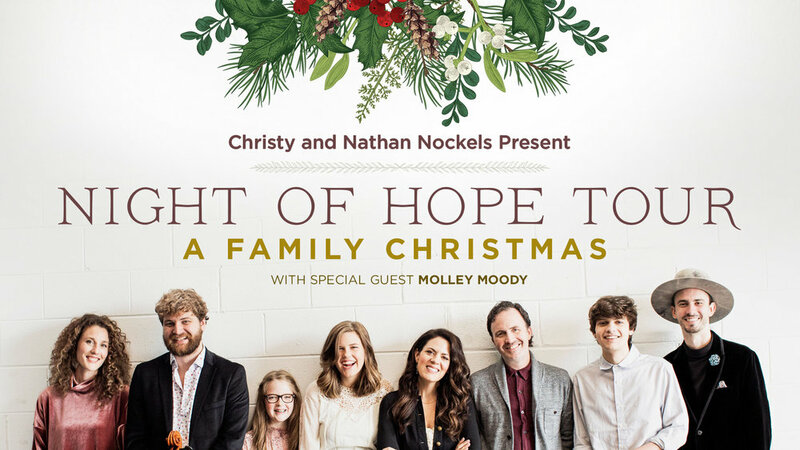 Before the show, the VIP Christmas Experience is your chance to connect with Nathan and Christy Nockels, take a fun photo, make some Christmas memories, and get early access to special VIP seating! Please arrive by 5:00 p.m. for check-in! Purchase tickets via the link above! No childcare available. Children 12 and under are free!